Northern Tablelands MP Adam Marshall, left, with Inverell Little Athletics Club Registrar/Secretary Natalie Tutt and President Bob Burling. VOLUNTEER parents and officials from the Inverell Little Athletics Centre are set to access vital training for coach accreditation with a $1,760 grant from the State Government’s NSW Sport & Recreation funding program. 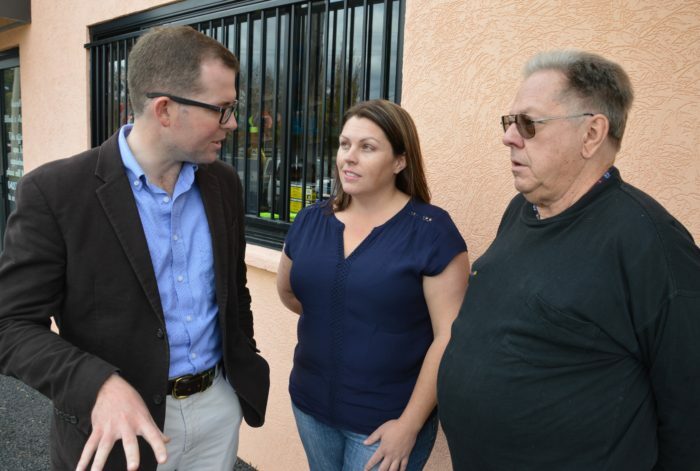 Northern Tablelands MP Adam Marshall met with the group’s executive recently to discuss the plans for the funding. “The Inverell Little A’s is a club that survived when a handful of dedicated parents and volunteers stepped up when the previous committee stepped down,” Mr Marshall said. “Without that commitment the club would have folded, leaving local athletes with no structured training and competition opportunities. Inverell Little Athletics Club President Bob Burling said the official accreditation will help deliver better outcomes for the centre. “When the current committee took on the role we started from scratch and this funding will be invaluable in ensuring the athletes have skilled guidance,” Mr Burling said.